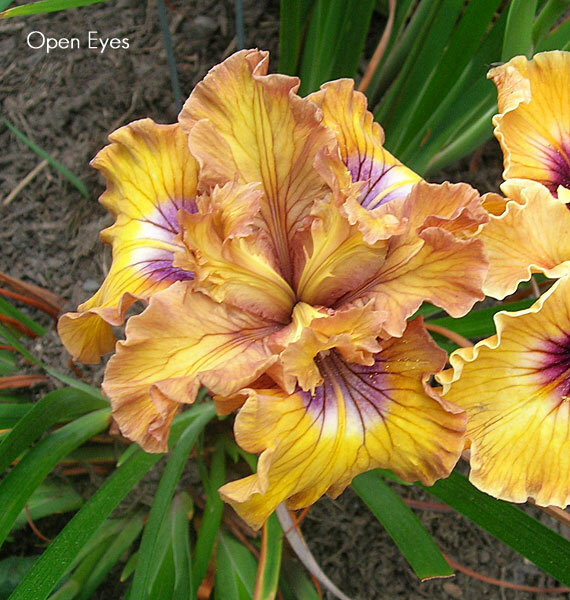 'Open Eyes' (Joseph Ghio, R. 2011) Seedling #KP-166S3. CA, 13" (33 cm). Late midseason bloom. Standards and style arms root beer; falls plover gold, root beer band, signal purple with turquoise flash in center. Seedling #HP-163D, Mandalay Bay' sibling X seedling #IP-139H2, 'Rich Uncle' sibling. Bay View 2011.